4 seater dining table with buil din braai/fireplace and kitchenette with stove, fridge, microwave. Ground of the property. Lapa for 3 bedroom visible. Fabulous garden with a range of flowers and trees. King-size bedroom with en-suite bathroom. Open plan lounge/kitchen with a 4 seater dining table, microwave, 2 plate stove, sleeper couch and built-in braai/fireplace. The fireplace and TV are both visible from the bedroom. The unit can be linked with the next door unit to form a 4 sleeper. Treelands Estate, based in the centrally located old part of Dullstroom, is a romantic, upmarket, self-catering, 5 unit establishment set in the most beautiful garden in Dullstroom. The garden hosts an array of flowers, rare copper beech trees, large lawn and other wonderful flora. The king size units are tastefully furnished, all with fireplace/braai, flat screen TV with DStv (hotel package) and all required cooking amenities. Five self-catering units. 1 x 3 bedroom unit (sleeps 8), 1 x 1 bedroom unit (sleeps 4), 3 x bachelor units. 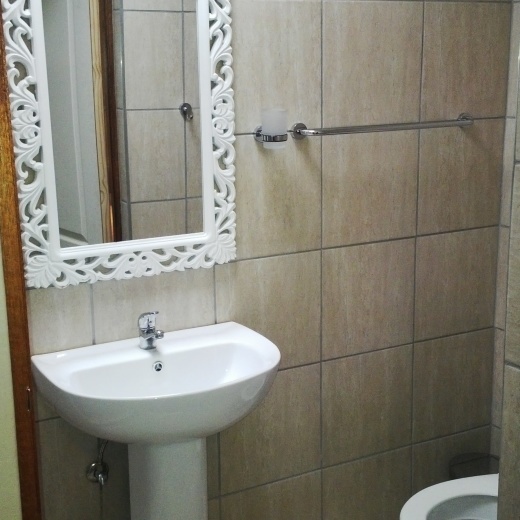 All units with king size beds (can be converted to twin beds), fireplace/braai, kitchen, dining area, DStv. Secure parking, armed response, centrally located. Suited for couples, families and larger groups. Please collect and return keys from Dullstroom Accommodation in the main road. For queries during your stay or extra houskeeping Elsie is available.